What is RTI Connext DDS? RTI Connext DDS is a network middleware built for real-time distributed applications. It implements the Data-Centric Publish-Subscribe (DCPS) API within OMG’s Data Distribution Service (DDS). As can be deduced by this name, the employed communications-model of this middleware is publish-subscribe. 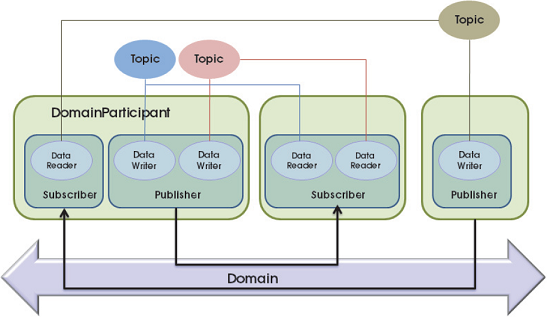 In this model applications “publish” data they want to share and “subscribe” to data they need. These messages of data flow directly between publishers and subscribers and hence eliminate the need of having a centralized node (server/broker) which has to organize the data-flow. A real life example of this model would be television or newspapers. The “data-centric” part of DCPS describes the fundamental concept supported by the design of the API. In data-centric communications, the focus lies on the distribution of data (known data types in named streams) between communicating applications. In contrast, in object-centric communications the fundamental concept is the interface (know methods of known types) between applications. Another strength of RTI Connext DDS is its advanced and easy to use quality of service (QoS) support. How does RTI Connext DDS work? Is a concept to bind individual applications together for communication. It can be seen as the “channel” through which data flows. Enables an application to exchange messages within a certain domain. Is used to create Publishers, DataWriters, Subscribers, DataReaders and Topics. Are used to send messages/data. A DataWriter writes the actual message/data and publishes it into a domain. A Publisher is used to group individual DataWriters together and to share common properties (e.g. QoS settings) among them. Are used to receive messages/data. A DataReader reads the actual message it has received. A Subscriber is used to group individual DataReaders together and to share common properties (e.g. QoS settings) among them. To establish a communication-channel, DataWriters and DataReaders must have the same Topic of the same data-type and be members of the same Domain. There is no need to define an address of a subscriber or publisher, RTI Connext DDS works with an auto-discovery mechanism to match publishers with subscribers. The following picture (Source: RTI Connext Core Libraries and Utilities Getting Started Guide) shows you the relationship of these objects and entities. In what Context is RTI Connext DDS used at the ICCLab? KIARA will use the plugin architecture of RTI Connext DDS to implement these extensions, but they should also be easily adoptable for alternative DDS implementations like OpenDDS. Remark: As this is a middleware, it is possible to send data from one platform (language/compiler/operating system/processor) to many others. Therefore there are multiple operating systems this middleware could be installed on and multiple programming languages an application could be written in. In this example the used operating system is Windows 7 and the programming language is Java (JDK1.7) with the Eclipse IDE (JUNO). RTI Connext DDS can easily be installed by using the installer. Copy the license file (as received by RTI) into the C:…RTI and C:…RTIndds.x.x.x folders. In order to be able to build applications, add C:…RTIndds.5.0.0classnddsjava.jar to your project libraries (Project–>Properties–>Java Build Path–>Libraries–>Add External JARs). As mentioned before, the documentation of RTI Connext DDS is abundant – the user manual alone is 780 pages strong – and very well and clearly written. The “Getting Started” guide shows you basics concepts and familiarizes with the API. There are also numerous code examples. And every example is available in C, C++, C# and Java. A big compliment has to be given here to RTI for this outstanding documentation of the product. I will now walk you through the HelloSimple example which also comes with the product. This application has two classes, a publisher who allows a user to write an arbitrary line of text and a subscriber who will receive this text as soon as it becomes available. Let’s start with the Publisher class which in this case is named HelloPublisher. domainID An integer value which defines the Domain the DomainParticipant is in. QoS Quality of service settings to be used. In this case the default QoS settings are being used. listener An optional listener (callback routine) to be invoked when specific events with respect to the DomainParticipant occur. mask Defines the type of events that trigger the callback routine (listener). type_name The name of the user data type. In this case, the built-in String data type is used. listener An optional listener (callback routine) to be invoked when specific events with respect to the Topic occur. If this is null, the DomainParticipant‘s listener (if existing) will be used. topic The topic for which this DataWriter will write messages/data. QoS The name of the user data type. In this case, the built-in String data type is used. listener An optional listener (callback routine) to be invoked when specific events with respect to the DataWriter occur. If this is null, the Publisher‘s listener (if existing) will be used. If you’re wondering why there was no Publisher instantiated. The creation of a Publisher is optional and if not explicitly created, a default publisher is used (this is an extension of RTI Connext DDS and not part of the DDS standard). Otherwise the Publisher could be used to create the DataWriter. Finally we can use the DataWriter to write – and automatically publish through the default Publisher – messages that we in this case receive as user input. The write() method takes two arguments. Instance An instance of the data type to be sent. In this case a String. InstanceHandle An InstanceHandle. This is used with keyed data types, a subject not covered in this blog. Before terminating the program, all entities of the DomainParticipant and the DomainParticipant itself are deleted. The Subscriber is very similar to the Publisher. There also needs to be a DomainParticipant and a Topic. The creation of those will not be explained again. Instead of a DataWriter, there will now be a DataReader. A listener will be implemented to automatically run when new messages are available. For the Subscriber to be able to receive messages sent by the HelloPublisher, the DomainParticipant must be in the same Domain and the Topic must have the same name and data type. After the DomainParticipant and Topic, the DataReader will be created. As can be seen, it has to be bound to a topic at instantiation time and in this case – for the first time in our example – uses a listener as well as a mask. The listener is, in this case, an instance of HelloSubscriber. That is also the reason why the HelloSubscriber class extends from the DataReaderAdapter class and overrides the on_data_available(DataReader reader) method which is the method that will be triggered once data becomes available. The mask indicates that this listener should be trigger as soon as new messages/data is available. Finally in the on_data_available() Method the logic to read data is implemented. Every received message (called sample) is actually composed of two parts. First of the message itself (here a String) and second of a metafile of type SampleInfo which contains additional information about that message. The created stringReader then tries to read the next sample with the take_next_sample() method into which it passes the info file. If the sample contains actual data, the valid_data property of the info object will equal true and the sample will be printed onto the console. This should have given you a small insight into RTI Connext DDS. There is still a vast amount of additional functionalities and configurations that this product has to offer. But after exploring this middleware for some weeks it has clearly shown to be an excellent starting point for the KIARA project. This entry was posted in Articles, HowTos and tagged Data-Centric, FI-WARE, KIARA, Middleware, Publish-Subscribe, RTI Connext DDS, RTI-DDS by Sandro Brunner. Bookmark the permalink. I really like this, very well described and formatted. Good work! Hi, Both of the files compile but the typed message (publisher) is not shown on the subscriber control? above the datawriter.write function, but that shouldn’t make any difference. I’ve now also uploaded the source code of the two files with which I just tested it. Maybe you’ll find a difference to your files when comparing them. You’ll find the download-link at the introduction of this article. I hope this’ll help you. If not, just get back to me. This is a great tutorial to start with.